Ancient cathedral town, capital of the department of Tarn, France, forty-two miles northeast of Toulouse. It gave its name to the famous Christian sect, the Albigenses, whose struggles against the Church of Rome were so fatal to the Jews of southern France. 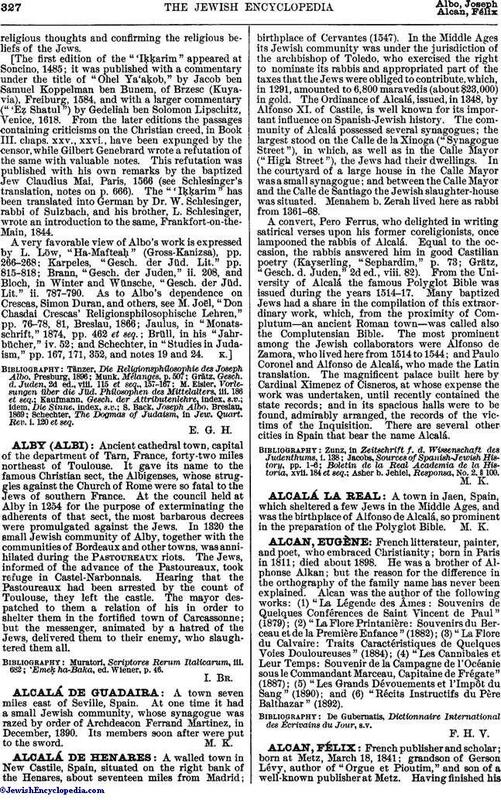 At the council held at Alby in 1254 for the purpose of exterminating the adherents of that sect, the most barbarous decrees were promulgated against the Jews. In 1320 the small Jewish community of Alby, together with the communities of Bordeaux and other towns, was annihilated during the Pastoureaux riots. The Jews, informed of the advance of the Pastoureaux, took refuge in Castel-Narbonnais. Hearing that the Pastoureaux had been arrested by the count of Toulouse, they left the castle. The mayor despatched to them a relation of his in order to shelter them in the fortified town of Carcassonne; but the messenger, animated by a hatred of the Jews, delivered them to their enemy, who slaughtered them all. 'EmeḲ ha-Baka, ed. Wiener, p. 46.